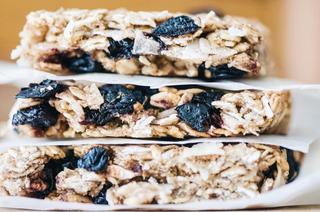 Naturally sweetened, chewy, healthy, and delicious blueberry coconut oatmeal bars! Ready to eat in 30 minutes! Vegan & gluten-free! These delicious blueberry coconut oat bars are a tried and true household favorite. As soon as my toddler sees me pulling out the ingredients to make these, he instantly gets a giddy look of excitement. And handing him one? He looks like he'll implode. Quite simply, these are most definitely a favorite around here! And, best of all? They are super duper quick easy to make. And, with pure and wholesome ingredients -- quite healthy as well! Whether you are looking for a tasty snack, a filling breakfast or a healthy dessert, or simply wanting to please a toddler of your own, you will find much delight in these chewy little oatmeal bars! So, so good. . .
Preheat oven to 350°F. Line a round or square baking dish with parchment paper, set aside.In a large mixing bowl, add your bananas and mash with a fork until smooth.Stir in all remaining ingredients and mix until evenly combined.Pour your mixture into your parchment lined dish and then using your hands or a spatula, press the mixture down firmly until even and compact.Bake for 22-27 minutes, or until firm and edges are beginning to turn golden.Remove from oven and let cool for at least 10 minutes before slicing.Enjoy!